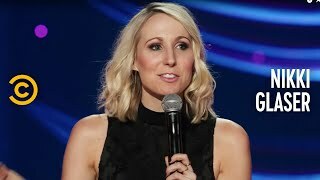 Nikki Glaser is a comedian. She became one after she text messaged "JOKE" to 7738 on her cellphone. She also became a hit at the office! But if you must know more, Nikki started performing stand-up comedy when she was only 18 and still attending college at the University of Kansas. Two years later, she auditioned for the fourth season of Last Comic Standing and was advanced to the semi-finals in Los Angeles. Although the show only took three days to shoot, she lied to her professors and was subsequently excused from four weeks of class. After graduating from college with a worthless degree in English, Nikki moved to Los Angeles and began touring clubs and colleges across the country. In the summer of 2007, she was invited to perform at the Just For Laughs Comedy Festival in Montreal, Canada. There, she met and performed with her comedy idols, drank alcoholic beverages, and thus lost her phone upwards of three times. In 2009, Nikki made her first late night appearance as a guest on The Tonight Show with Jay Leno. There, she had fun and stole a beer from The Office's Rainn Wilson's dressing room, but not before calling him "Dwight" on live television when she sat down on the couch next to Leno's desk. In addition, she was just named one of the Top 10 Emerging Comics by Askmen.com. Currently, Nikki is performing in clubs all over the country and attempting to write the biography for her website.